Growth rates, relative to business valuation, present as short-term growth, long-term growth, or negative growth. In the business valuation process, growth rates are used as key factors in the discount future cash flow approach. 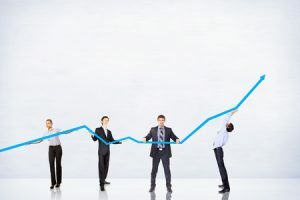 A high growth rate influences higher business value. It is important to keep in mind that growth at high percentage increments cannot be sustained indefinitely. As a result, it is optimal to take a more conservative approach and to use the first year growth rate based on interim performance and then to taper off years 2-4 to between 3 percent to 5 percent. The projections should be based on both the historical and current “trends” and should not be based on buyer or “post-acquisition” plans. Projections should reflect the performance of the company “as is” and that which is reasonable going forward without forecasting synergies or plans after a strategic acquisition. This strategy is equally applicable to companies with downward trends and negative future growth rates. Banker Valuation’s Internal Business Valuation Tool focuses on the short term growth rate as it reflects reasonable growth which is calculated by combining historical growth and interim (year to date) performance.